KitchenAid® 5-Speed Hand Mixer Only $30! (Reg. $39) Ships FREE! You are here: Home / Great Deals / Christmas Deals / KitchenAid® 5-Speed Hand Mixer Only $30! (Reg. $39) Ships FREE! Get 25% off select KitchenAid items! Head over to Target and get the KitchenAid® 5-Speed Hand Mixer Only $30! (Reg. $39) Lots of colors to choose from! Shipping is FREE! Or opt for FREE store pickup! KitchenAid is known for its quality mixer technology, and the KitchenAid 5-Speed Hand Mixer is no exception. This powerful mixer has 5 speeds to help you accomplish all the whipping, beating, and mixing you need. 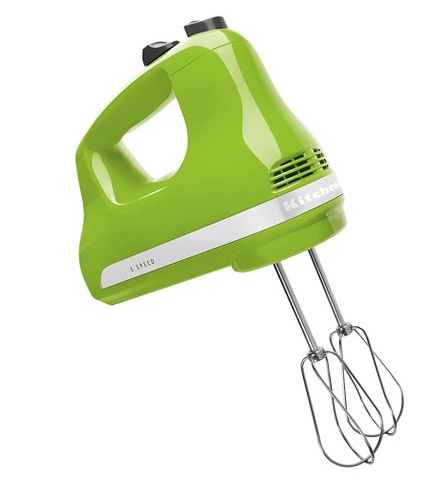 Designed to be easy to use, the mixer is lightweight and features a comfort grip handle.